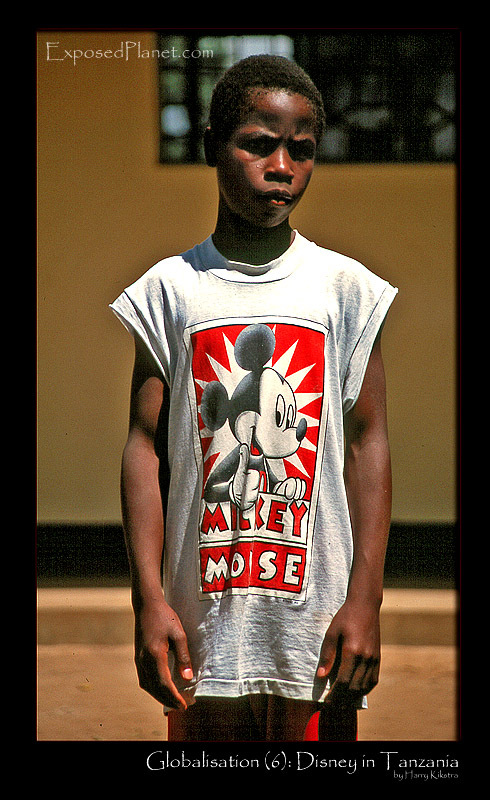 The story behind "Globalisation (6): Disney’s Mickey Mouse in Arusha, Tanzania"
This boy with the giant Disney T-shirt was very concentrated, as he was getting ready to do some acrobatic jumps that he had been practicing for weeks with his classmates. Some of the children that are not A-students are being kept from leaving teh school by lessons like these, as they really enjoy them and for some there is actually a career in acrobatics, not just for tourist shows, but also for the locals. This was taken in the playground of a school in Arusha, Tanzania, where we were filming for the dutch TV show PlanetRace, with Canon Eos3, shot on Provia 100 slidefilm, scanned later.